Pacific Northwest Ballet company members in "George Balanchine's The Nutcracker"
For millions of people around the world, this time of year is magical. Tis’ the season of hope and faith and the gossamer web of traditions that surround and reinforce them. 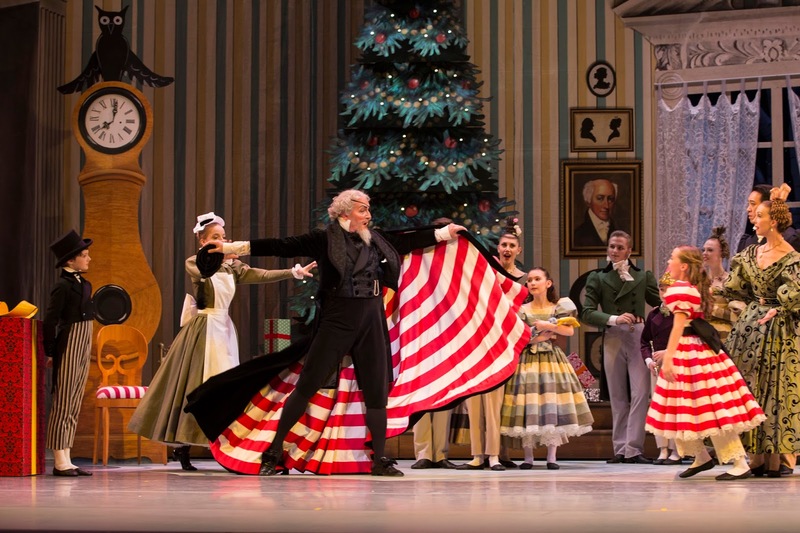 Annual holiday arts are an integral strand in that web, from Handel’s “Messiah” to “A Charlie Brown Christmas”. On Sunday, November 29th, ACT Theatre opened its 40th annual production of Charles Dickens’ classic “A Christmas Carol,” adapted by Gregory Falls. 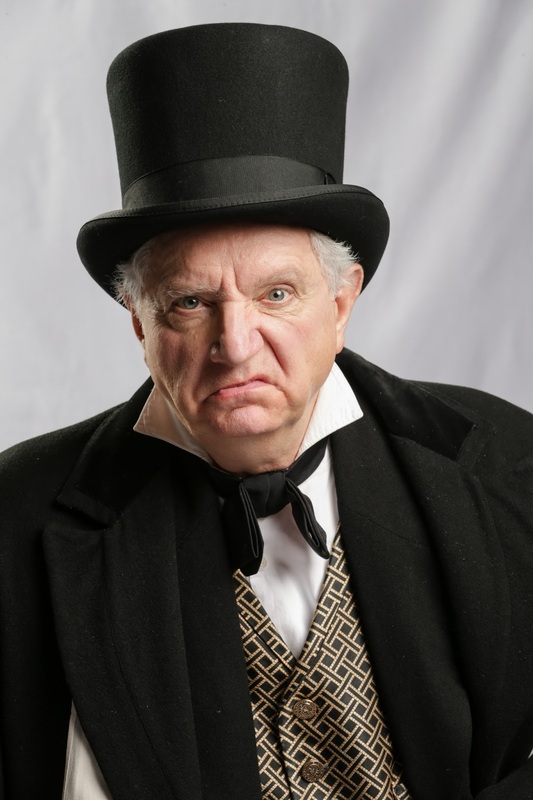 This year’s frisky production, directed by ACT’s incoming Artistic Director John Langs, features outgoing AD Kurt Beattie and Seattle veteran Charles Leggett alternating in the role of Ebenezer Scrooge. Kurt Beattie as Ebenezer Scrooge in ACT Theatre's "A Christmas Carol"
I caught Beattie at the early afternoon matinee, and he was everything you want from Scrooge: first irascible and nasty as he snaps at poor Bob Cratchit, then terrified by the visions presented to him by the three Spirits, ultimately frothily giddy when he realizes the possibility of redemption. The rest of the cast was solid, but I was particularly happy to see G. Valmont Thomas scaring both Scrooge and the audience as a zombie-like Jacob Marley. Director John Langs notes in the program that many people have asked if he will choose a new holiday offering next year when he’s in charge of ACT’s programming. “I think it’s a good question, and one we must never stop asking, as the challenge of any art is to stay relevant”, he writes. But Langs goes on to say that Dickens’ tale endures, and continues to resonate in peoples’ hearts every year. And in his own. It’s a tradition for both theater company and theater patrons. I get the impression “A Christmas Carol” will be around at ACT. At least, I hope so. 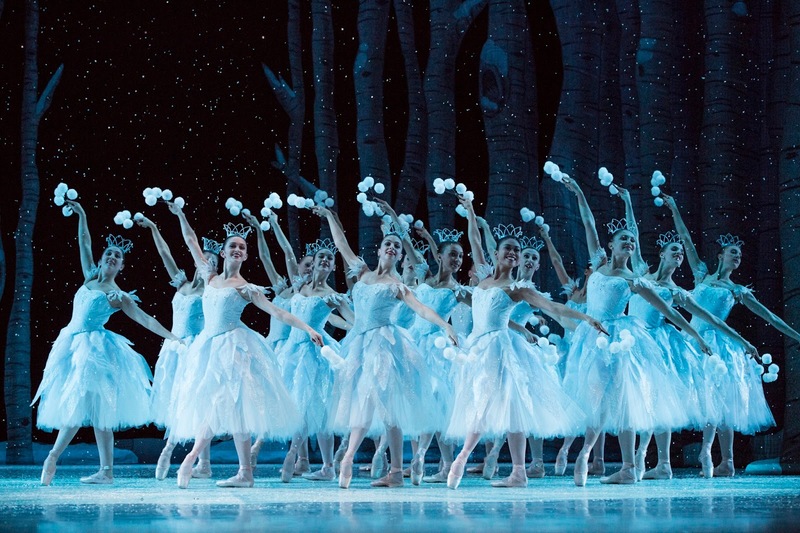 Across town, at Pacific Northwest Ballet, one venerated tradition has replaced another. It’s a risky move for a company that depends on a holiday classic for more than a third of its annual ticket revenues. Uko Gorter as Drosselmeir with Isabelle Rookstool as Clara in PNB's production of "The Nutcracker"
Four years ago, PNB Artistic Director Peter Boal decided to mothball his predecessor, Kent Stowell’s, production of “Nutcracker,” designed by the venerated children’s author and illustrator Maurice Sendak. Boal grew up with legendary choreographer George Balanchine’s version. That’s what inspired him to take up ballet and he performed in that Nutcracker production throughout his long tenure at New York City Ballet. For Boal, it’s the tradition that resonates in his heart and the one he wanted to bring to Northwest audiences. 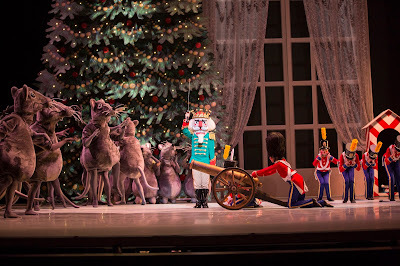 So, this year, PNB premiered a sparkly new production of “George Balanchine’s The Nutcracker” with sets and costumes by another celebrated children’s author and illustrator, Ian Falconer, creator of the Olivia the Pig series of books. Four days after seeing the show on opening night, I’m still not sure how I feel about the change. Falconer’s costumes range from whimsical to sublime: a dozen golden angels glide like human bells across the stage; the orange-hued Flowers look like a field of marigolds when they begin to waltz. And Tchaikovsky’s lush score is, in a word, divine. 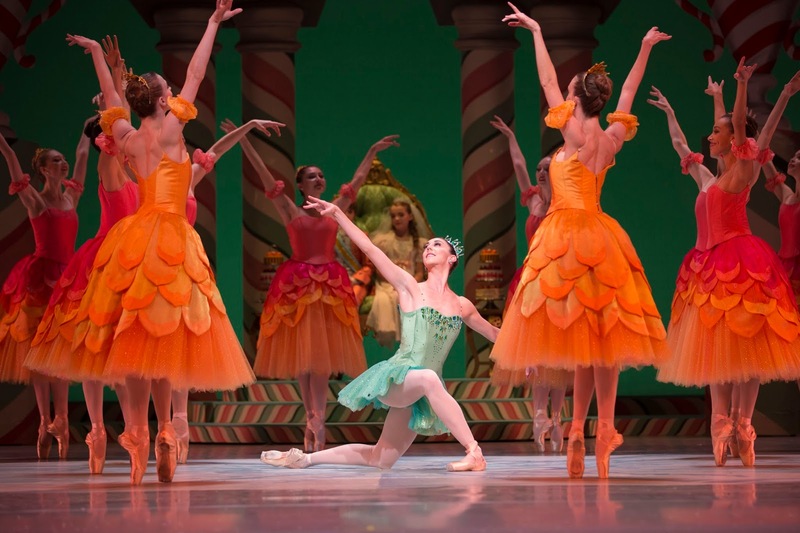 PNB Principal Dancer Laura Tisserand as Dew Drop, surrounded by the Flowers in "The Nutcracker"
There’s a lot to love in this ballet: in addition to the beautiful Flower and Snowflake scenes, Clara and her Nutcracker are taken to the Land of Sweets in the second act. A Sugar Plum Fairy clad in bright purple greets the children and introduces them to a bevy of performances. Soloist Benjamin Griffiths nailed a difficult hoop dance; Elle Macy beguiled as “Coffee,” (although she’s dressed as a peacock, so why is she called Coffee?) And Sarah Ricard Orza and William Yin Lee were delightful leading the Hot Chocolate section. Jerome Tisserand’s appearance as the Sugar Plum Fairy’s Cavalier was all too brief. 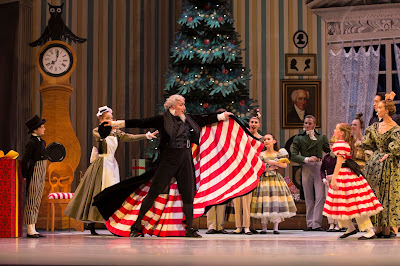 This dancer was born to the princely roles: he seems to defy gravity as he whirls across the stage. His Sugar Plum Fairy, Elizabeth Murphy, newly promoted to Principal on opening night, was less confident in her role. Maybe all she needs is a little more time to get used to the new choreography? For me, the night belonged to Joshua Grant in the role of Mother Ginger. Trussed into a 60-pound, ten-foot long Airstream trailer of a skirt, Grant minces onto the stage on a pair of stilts hidden under the skirt along with eight children. As the kids emerge, one by one, Grant camps it up for the audience. His Ginger added some welcome spice to all the sweetness of this production. 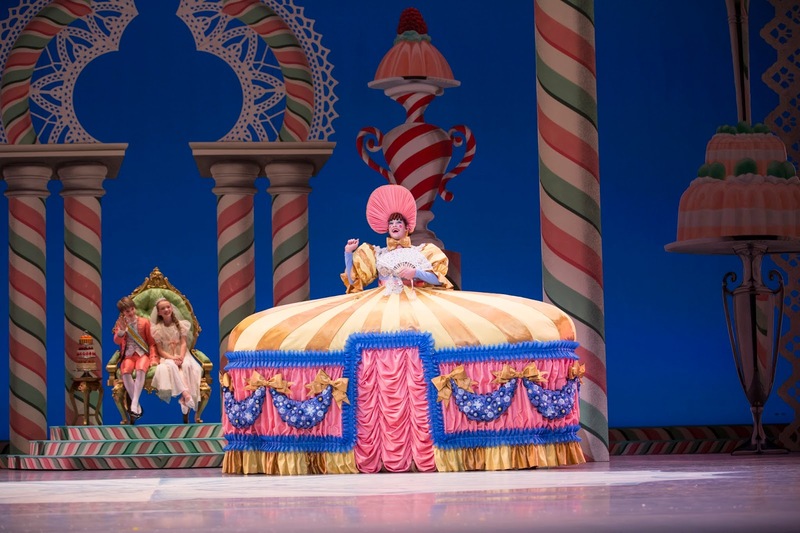 PNB soloist Joshua Grant as Mother Ginger in PNB's "The Nutcracker"
Longtime PNB audiences may need some time to fully embrace this new Nutcracker production. I know I want to see it a few more times before it gels for me. 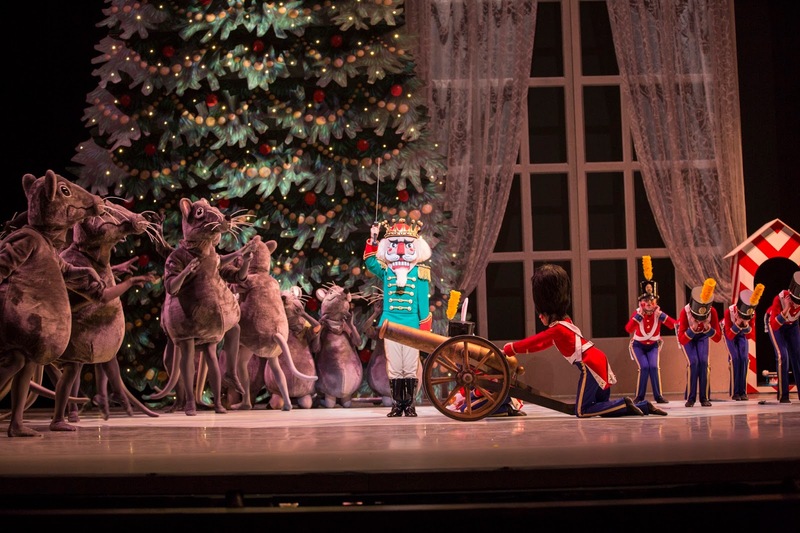 But judging by the opening night audience’s roaring standing ovation, the ballet has a hit on its hands.